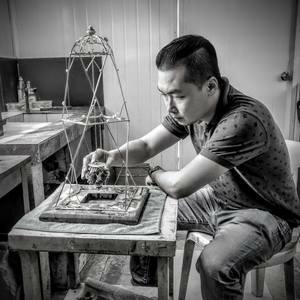 As an ardent and boundless artist, Ivan Co brings into play his years of jewelry making into forging bejeweled sculptures. Being a third generation jeweler, the artist’s experience in metallurgy and design enables him to create bigger works of art with lustrous and glistening elements that move. Movement is a crucial principle that greatly differentiates the artist’s work from static forms of art. “The purpose of my kinetic art is to evoke stillness in the viewer, ironically – for them to find their own personal peace while staring at my work. My life wasn’t excused of entropy, and with that is the desire to find moments of calmness amidst life’s adversities,” he says, and his sculptures give just that. The artist lives and works in Manila, Philippines.